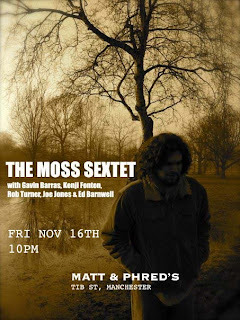 The Moss Sextet played down at Manchester's ubiquitous Matt and Phreds on Friday the 16th November. I spotted this gig courtesy of musician friends I've hooked up with in Facebook, being duly informed by my news feed that a few of them were attending the 'Moss Sextet'. On clicking through a few links I spotted that band leader Moss Freed is Berklee Alumni and eventually made it to their MySpace. The Sextet have some really interesting tunes and Moss has clearly worked hard on the sophisticated arrangements. There's elements of Philip Glass style minimalism at the start of 'Obstinato' which rapidly shifts into a classy contemporary chord sequence in 5/4 with a violin adding to the overall jazz classical piquant fusion. 'Crimes' hits you in the face with a fast sharp angular line and then catches you with a warm and comfy funk groove provided by Luke Flowers of the Cinematic Orchestra. Moss goes for quite a twangy trebley guitar sound that I can't decide if I think works, but full marks for going for something different to the usual mellow thuddy jazz tone. I suppose I go for something imbetween, Moss being more at the Mark Ribot end of the spectrum. So all looked promising for the gig. It was their debut and it's fair to say this showed. It was a nervy performance that was rough at the edges but nevertheless the promise of the material showed through. Many of the tunes are complex and I suspect more rehearsal would have helped but the spirit and vibe hit the spot much of the time. I've seen sax player Kenji Fenton a few times and have always rated his playing but he was on especially good form tonight and really digging in to his solos with some powerful muscular playing. Keyboard player Ed Barnwell's playing was nice and sharp as well. 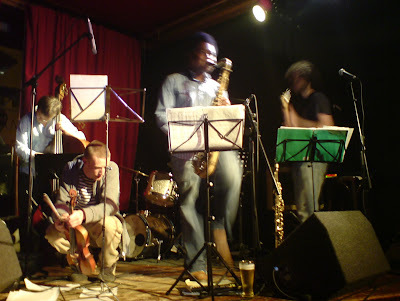 The Sextet have got more gigs coming up so I'm looking forward to seeing them becoming a sharp and well honed act on the Manchester jazz scene that ought to be a force to be reckoned with. 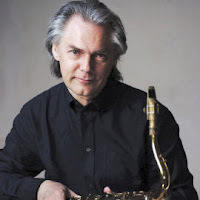 ... and so it was on Saturn's Day the 17th in the novem month of the year 2007 the mighty Jan Garbarek came to Manchester. An expectant public filed into the Bruntwood Theatre at the RNCM to honour the impressive line up consisting of Manu Katché on drums and Rainer Brüninghaus on piano/keyboards. 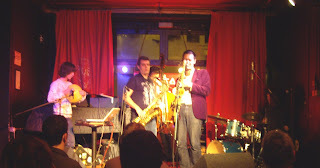 Eberhard Weber was due to be in attendance on bass but this wasn't to be and the spot was filled by Yuri Daniel. Am I the only one who finds it annoying that jazz groups feel they can switch the line up unannounced. 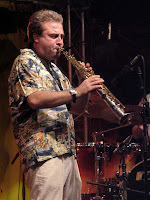 It's somewhat ironic that this happens routinely with jazz in particular, as the individual musicians are frequently considered to be as important as the group. I'm sure some people were there to see Eberhard Weber and would doubtless have been disappointed. I was keen to check out Manu Katché and would have been furious if he had been replaced. The irony is that this would utterly unacceptable in the pop and rock world. Imagine the uproar if Led Zeppelin were to show up without Jimmy Page and Robert Plant on the forthcoming tour. Anyway, to the gig. Jan strode on looking every bit the handsome Nordic God that you might say he is, the rest of the band looking striking in black also. The gig began really well with the first track veritably blowing me away. It started with a moody synth wash and some speculative reverbed sax line fragments. The track then developed through a number of sections with some fantastic playing from drummer Manu Katché. He has a delicious lazy feel that's truly engaging and delightful to bask in. His playing is also precision perfect and never loses drive and force the way many laid back players do. The track was quite a long orchestrated piece all the while slowly building momentum and after a few shifts of gear finished on a knockout high. The mood and feel of the concert carried on more or less the same which worked for another couple of tracks but after this it did start to flag. Garbarek clearly has a different and individual approach but it can start to sound a bit samey after a while and the high register playing was getting quite wearing in the latter part of the set. Much of the piano playing was quite gorgeous with Brüninghaus having a distinct classical twist giving some of his improvised melodies a quaint innocent period charm. 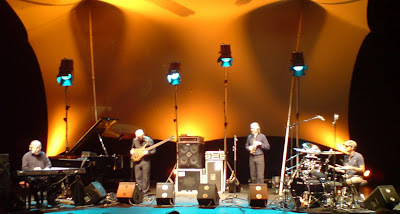 As with Garbarek, the sonorities of his playing are noticeably European with far less blues and bop than is usually heard in music going by the name 'jazz'. This is refreshing to hear but can wear thin if it's overdone as I think it was here. On the whole this was a good gig and it appeared to connect with the audience judging by the atmosphere and applause. Perhaps just a little more variety in the harmony and compositional approach would have made it a much better one. After faffing about and making excuses of one sort or another I finally dragged myself down to the Matt and Phreds monthly jazz jam run by sax player Ed Kainyek last Monday. My first experience of this was a good year ago now and hadn't gone too well but that's the way it goes with jams I guess. This Monday went pretty well I'm pleased to say. First up was a slightly funky version of 'Maiden Voyage' that I think was great. I'm historically a trained funkster having been part of the London 'Acid Jazz' scene when I had the luxury of being a full time musician. Not surprisingly then, this sort of vibe sits nicely under my fingers and I can generally pull it off pretty well. After this track Gavin Barras joined us on bass. We agreed it was nice to finally get to get to play together after having met a little while ago. He seemed into the Maiden Voyage vibe which was good to hear. We then had a crack at 'My Favourite Things'. We did the straight form version without the Coltrane E-7 to F#-7 long modal vamp so it was medium concentration all the way. It's quite a long form without many harmonic signposts so fairly easy to get lost in, but it more or less hung together. By no means my most inspired improv but no disgrace either. It was great to catch up with pianist Sam Smith of Mrs Columbo, recently returned to Manchester after a years sojourn at the Birmingham Conservatoire. He was a great player before he went and continues to get even better. We had a good chat about various inspirational books on music. It was the first time I've come across house band drummer Ben Gray who seemed a pleasant chap. On the last track of the second set (can't remember it's name) I got up with Jo McCallum and local stalwart, drummer Rob Turner. It was another groove track that I hadn't played before with a few key shifts but looked manageable. It ended up being a long version so I passed on the improv (or I had my head down at the wrong time or something). All in all a pretty good evening and I'm looking forward to getting out again. Next stop I think will be Ed's weekly jam at The King's Arms in Salford if it's still going. A special one down at Matt and Phreds last night. Polar Bear visited us up here in the dark wet and windy North pole of England. I saw this lot at the Cheltenham jazz festival last year and was mightily impressed so I was looking forward to another good one. They have such a distinctive style and sound that their particular Polar Bear vibe is established within seconds of the first tune starting. What really impresses me about this group is that they manage to be very original and really quite avant garde and yet maintain a high level of listenability. There's no thick chordal instrument in the line-up muddying the middle range which helps, allowing the fast saxophone flights of fancy, grunts and squawks the space they need to be heard. The arrangements are frequently quite sparse and some of the horn lines almost childishly naive and simple, all adding to the freshness. A good example is 'Fluffy I want You', essentially a rhythm driven track with a simple two note figure that gets shifted and pushed about in various oblique ways. Dramatic changes of intensity along with gaping empty pauses all add to the curious plot. Every player has there own unique take on their instrument. Band leader Seb Roachford kicks out a wide repertoire of styles from rockabilly, marching band and funk through to some classic swing and laid back blues with an upright indie band style swagger. 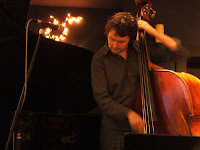 Double bass player Tom Herbert gets full marks for being the first double bassist I've heard who manages to get every single note audibly across. He has a cool slightly shy funky feel as well. Both tenor sax players Pete Wareham and Mark Lockheart combine the ability to knock out punchy simple lines and yet can get raucous at will. The sheer intensity of Pete's playing sledge hammered the audience into submission in the second set and grabbed the band some of the biggest applause I've heard down at Matt and Phreds in quite a while. Leafcutter John came across much better than I remember from last time. He was busy sampling his mandolin and Pete and Mark's sax to create sweeping echoed pitch shifted drones for the sax players to launch off from. At other times he was using a games console to trigger some electronic blips and beeps . This sort of thing can sometimes sound a bit random and incongruous but he managed to get it to sit in the polar sound perfectly on the whole. It's been a busy few months on the MCR jazz front. The RNCM is having a particularly good run with 'name' acts Tord Gustavson (great gig, but too short at 1 hours 20 mins), Jan Garbarek and Mike Gibbs as well as a host of home grown acts. Last night was the turn of the Tim Garland Northern Underground Orchestra to shuffle onto the stage. As Tim mentioned many times, the group includes many of our local players such as Mike Walker, Andy Schofield, and Richard Iles. It was another really good one and the first chance I've had to check out pianist Gwilym Simcock who was really excellent. I found his somewhat somber and stern manner amusing and the playing was wonderful. Tim talked about a composition contest he'd set up where he invited entries arranged for big band in a 'Steely Dan' style. They played two of these compositions giving Mike Walker the perfect excuse to let loose with some fiery overdriven Dan'esque style guitar soloing. No thuddy mellow jazz guitar tone here. For my money it was the best I've heard Mike play since the Matt and Phred's gig at the 2006 Manchester Jazz festival. Andy Schofield and Paul Booth on sax and Barnaby Dickinson on trombone were also hitting the sweet spot.